In search of high resolution separation between protein monomer, aggregates, and fragments. Screen different column phases (Zenix-300 and Zenix-C 300) to achieve best separation. 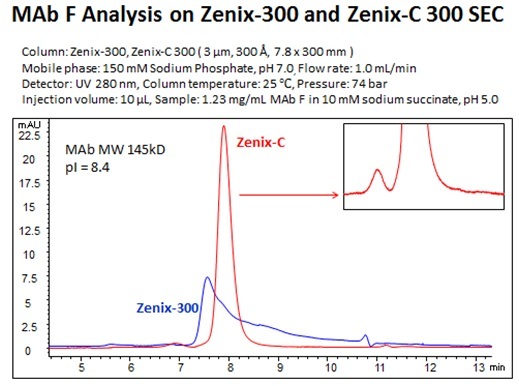 Zenix-C SEC-300 (3 µm, 300 Å) column delivers baseline separation of monoclonal antibody monomer and aggregates. 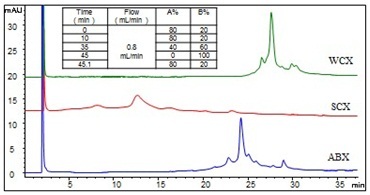 In search of most suitable stationary phase and separation conditions for the analysis of antibody F variants. 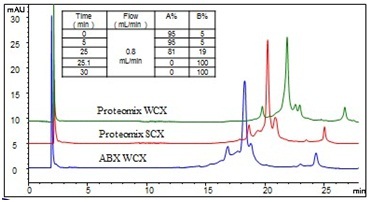 Screen variety of cation exchange stationary phases (Proteomix SCX, WCX and Antibodix WCX) at analytical level (4.6 × 250 mm) with mobile phase screening. 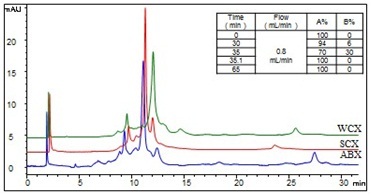 Antibodix NP5 (5 µm, 4.6 × 250 mm) column with NaCl salt gradient at pH 7.5 offers the best selectivity and resolution for the antibody variant separation among the phases screened. In search of high resolution separation between protein monomer, dimer, and high molecular weight aggregates. Screen different mobile phase to achieve best separation and sample recovery. 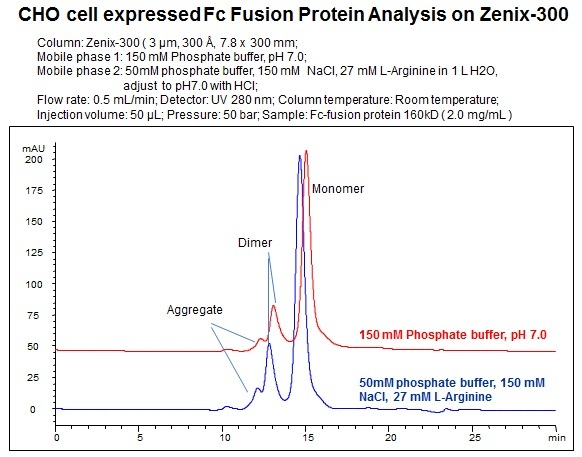 Zenix SEC-300 (3 µm, 300 Å) column delivers baseline separation of Fc fusion protein, its oligomer, and impurity. With the addition of arginine, the hydrophobic interaction between Fc fusion protein and column resin is minimized.